Welcome to Life Coach Media. 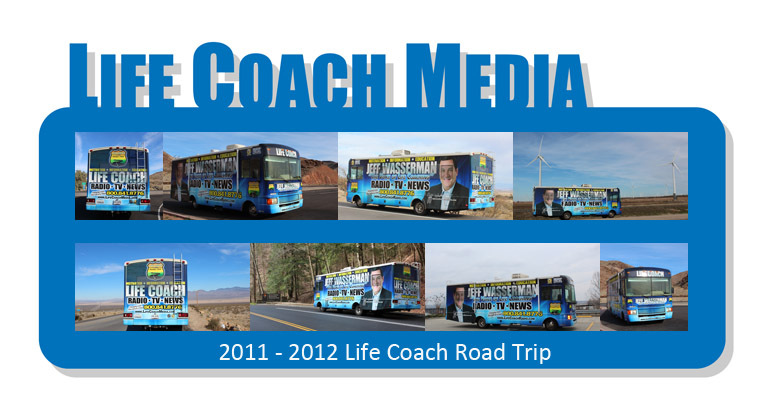 Jeff Wasserman, Life Coach and Media Personality is traveling the country in the Life Coach Bus sharing his secrets for a better life. Jeff believes if you want to improve your life, improve yourself. If you want to live a better life, change your philosophy on life, which will change your attitude in life, which will help you live a better life. Stop "getting through life and start living life." Isn't it time to create a lifestyle, one full of happiness, contentment, gratitude and love? Merriam-Webster Dictionary defines a Life Coach as; an advisor who helps people make decisions, set and reach goals, or deal with problems. Although I may change the definition around just a little, this is a very accurate definition of a Life Coach. Jeff hosts Life Coach Radio Show, available on Itunes and on line. Click here to listen to Jeff's latest show. 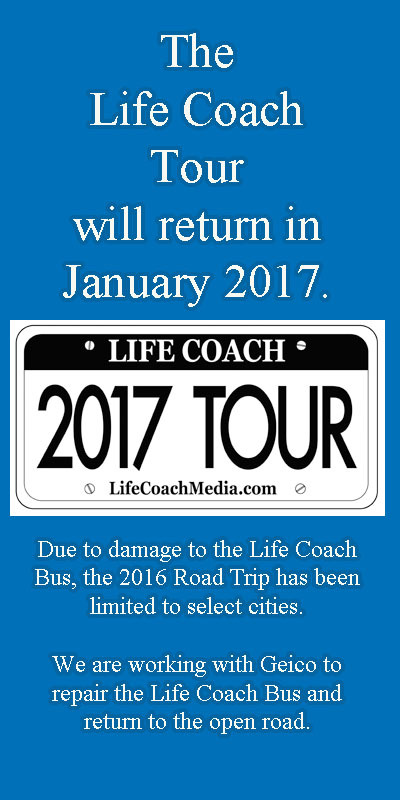 The Life Coach Tour will continue starting in January 2017. While the Life Coach Bus was parked in a secure lot, the manager of the storage yard hit the Life Coach Bus with his personal trailer. The Life Coach Bus has been in the repair shop for the last 91 days. We are working with his insurance company, Geico Insurance to try and resolve the claim. Once the Life Coach Bus is repaired and ready to travel, I will be on the road again. To all those who have called, emailed and texted to say they miss seeing me on the road, I want to personally thank you. The damage to the Life Coach Bus has been devastating to the Life Coach mission. Life Coach Media is the home of Jeff Wasserman, Life Coach and media personality. Jeff is the voice of Life Coaching, often called upon as a spokesperson for the profession. Jeff is an experienced business owner, media personality, massage therapist, reflexologist and professional Life Coach. Jeff has been in the Life Coaching business for over fifteen years, in 2003 Jeff formed Life Coach Marketing to operate the Life Coach businesses. In February 2003, Life Coach College was formed to train individuals and groups using the most modern scientific based Life Coaching skills and tools. In order to bring unity to the Life Coaching profession, Jeff along with several other experienced Life Coaches, created the US Life Coach Association. The USLCA is currently accepting new members and looks forward to growing and eventually becoming the leading trade group in the Life Coach profession. Jeff's newest project is the National Coaching Association. Most coaching trade groups or organizations limit coaches based on training, specialities or geographical area. The National Coaching Association will admit any and all coaches, even sports coaches, provided they agree to uphold strict ethical guidelines. 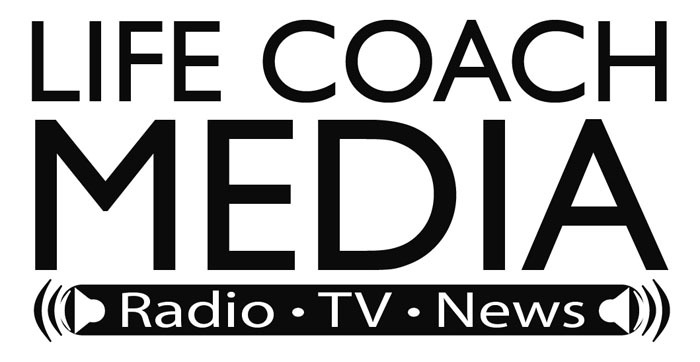 Jeff Wasserman created Life Coach Media to bring you a multi-media Life Coaching Media Station. A place on the web offering Audio, Video and news on Life Coaching, self-help and personal development. Jeff travels the country in the Life Coach Bus sharing his ideas and Life Coaching skills with people who wish to solve problems in their life. The 2012 Life Coach Road Trip started August 22nd, 2011. During the first four months, Jeff Wasserman traveled over 3,000 miles from Dahlonega Georgia to Los Angeles California. Jeff stopped each day and spoke to groups, students and audiences at restaurants and local businesses. Jeff spoke on topics ranging from relationships, career, money, children, family, health, retirement and investing. Life Coaching covers all areas of your life. Jeff Wasserman, host of the new Life Coach Radio Show broadcasts his show live from restaurants, special events, fairs, schools, parks, retail stores and hotel lobbies. Jeff is always looking for individuals wishing to be interviewed on his show. Jeff's show covers all areas of your life. Jeff leaves religion and politics to the other talk radio hosts. Life Coach Radio Show is new, interesting and offers helpful insight into what's holding you back from living your authentic life. Life Coaches are always looking to stay in touch. Life Coaches are life long learners. In 2001, Jeff Wasserman created Life Coach News. Originally a monthly print magazine, following the trends in the magazine business, Life Coach News changed formats in 2005 and went on-line. Today, Life Coach News is the leading Life Coach source for up to date information. Originally designed in 2001 as a source for Life Coach Videos, today Life Coach TV is being relaunched as a news and information channel. Life Coach TV will offer several self-help, Life Coaching shows. Jeff Wasserman will be broadcasting his radio show as well as interviews along his journey. If you remember Charles Kuralt, traveling the back roads for CBS in the FMC motor home, Jeff will be offering similar types of stories as he travels in the Life Coach Bus. 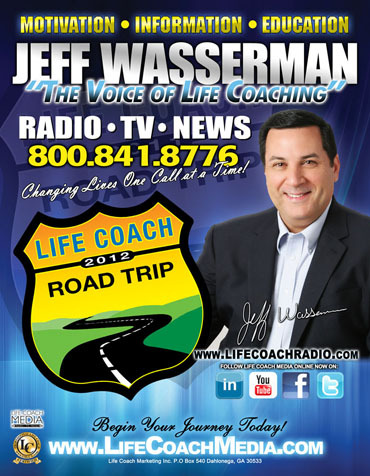 Created in 2003, Life Coach Radio is the home for Jeff Wasserman's Life Coach Radio Show. 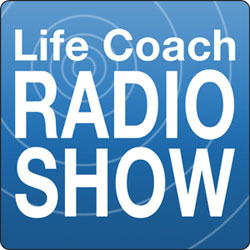 Life Coach Radio will be evolving in 2012, to include other radio shows on self-help, personal growth and personal development. Life Coach Radio will be your one stop source for positive, life changing information and shows. For those looking to become a Life Coach or learn the necessary coaching skills to be able to help others, Jeff Wasserman started Life Coach College in 2003. Life Coach College offers basic 60 hour coach specific training, required for membership and certification in some professional coaching organizations as well as continuing eduction courses for Life Coaches. Life Coach College also offers coach training for large corporate organizations. The US Life Coach Association was formed in 2003 to allow all Life Coaches with professional coach training to join a Life Coach organization. All members must agree to adhere to the code of ethics of the USLCA. The US Life Coach Association is a national trade marketing organization. The USLCA focuses on bringing coaches and clients together, not lobbying government entities or attempt to become the sole testing organizations for Life Coaches. The US Life Coach Association is only focused on helping coaches become successful and helping individuals get the most out of coaching. If it involves Life Coaching, Life Coach Marketing Inc, and Life Coach Media will be there to bring you up to date information. Whether you are thinking about becoming a Life Coach or need help marketing your coaching business, Life Coach Marketing is here to help. We are the one stop shop for Life Coaches, offering complete coach training packages through Life Coach College, certification and continuing education courses. For coaches who are finding it difficult or do not wish to spend hundreds of dollars each year belonging to international coaching organizations, the US Life Coach Association may be for you. Only focused on the United States and only focused on bringing you more clients, helping you promote your business and showing you other coaching models that may be helpful in your coaching practice. Have You Seen The Billboards on I-75? 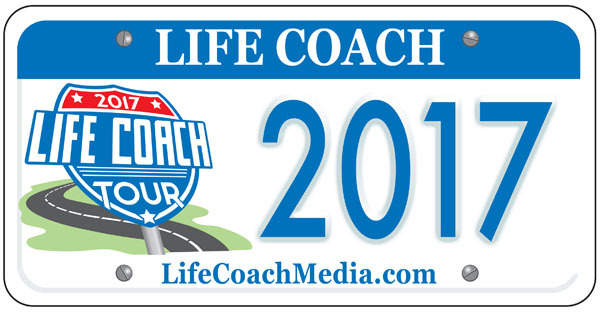 Watch for the Life Coach Bus in your town. Jeff Wasserman will be touring the United States in the Life Coach Bus in 2017. The Life Coach Bus will be traveling from city to city, hoping to meet as many people as possible. If you own or operate a business and would like the Life Coach Bus to visit, please call Jeff at 800-841-8776. Jeff will be broadcasting his radio show, Life Coach Radio Show live from each stop. If you are a Life Coach and looking to increase your business and align your practice with the most talked about Life Coach in the business, please call Life Coach Marketing at 706-864-5025. Jeff loves to visit fairs, street festivals, special events, carnivals, anywhere there is a large gathering of people. If you are responsible for organizing an event in your town, please consider inviting the Life Coach Bus to visit. Are you a radio program director or station manager? Looking to create buzz or bring new content to your station? Jeff is looking to work with a terrestrial radio station, both on air and special events. Please call Jeff at 800-841-8776 to discuss your ideas and thoughts. I update the blog often from the road.